Mastitis is something that has been around for as long as people have been milking cows. Simply put it is an infection in the udder of the cow. Thankfully through good milking protocol, keeping cows clean, good nutrition and a few other things our incident rate is very low. The top left area is the control. So as you can see this mastitis culture is growing in the bottom left area. 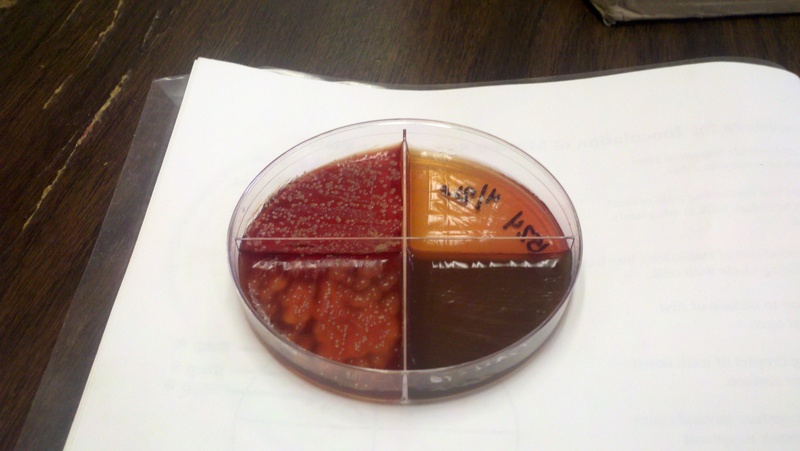 Unfortunately this means it is a Staph Aureus infection. This is a contagious infection that is also very difficult to treat. In fact treatment is usually ineffective. So as much as we hate to do it, this cow will be sent to market. Luckily like I said, we don’t have a lot of mastitis cases, and only a fraction of the mastitis cases end up being staph. That is why we sell these cows as quickly as possible, it helps prevent her from spreading it to any other cows. If it were a treatable type of mastitis, the cow would be treated with the appropriate antibiotics and her milk would be dumped down the drain until the required milk with holding time was passed and the antibiotics were out of her milk. That’s great! You must have an incubator on site. A much faster way to get it figured out (and cheaper).